I like to say that email marketing is like a headed cabbage. It might seem like a simple concept, but it has many layers. In fact, the deeper you go into the email rabbit hole, the more you realize that there are more things you need to pay attention to and optimize than you had thought. Before you know it, you can get overwhelmed with ESP features, analytical metrics, and dozens of option forms. This can result in a disease that I call email confusion; companies that suffer from it show symptoms such as low open rate, low click-through rate, and unengaged subscribers. Luckily, there is a very effective cure for that. 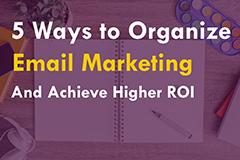 If you organize your email marketing effectively, you’ll see the results right away: improved open rates, engaged subscribers, better conversion rate and higher ROI. In this post, I’m going to share 5 things you can do to organize your email marketing. There is a special bonus for overachievers at the end of the post, so be sure to check it out. Segmentation is the cornerstone of email marketing because it informs smarter campaigns. By grouping your subscribers based on a set of characteristics, or triggers, you ensure that you send relevant information to a highly targeted audience. Many email service providers (ESPs) let you tag each subscriber based on the actions they performed, such as buying your product, visiting sales page, or dropping out of the webinar half-way. To make sure you have good data on hand to segment your subscribers, make sure you set up tagging for every kind of event that’s relevant for your business. If you’ve been building your email list for a while, you probably have dozens of opt-in forms floating around your website, landing pages, and affiliate web properties. Many of them probably use similar language or offer the same opt-in freebies. If you don’t keep those forms organized, you might end up doing double work and wasting time that could be better spent on email analytics or A/B tests. A big step towards organizing your opt-ins is creating them in one platform, whether that’s your ESP or another tool, such as LeadPages. Being able to look at a single page with a list of all opt-in forms you own will allow you to save time on creating new ones, analyze and compare their performance and reuse the most effective ones. You need to have a thought-out strategy and schedule for your email marketing so that the emails you send feel like a coordinated campaign (vs. a series of one-off messages). While developing a content calendar takes time, it will save you more time down the road, because your marketing team won’t have to go through the same strategizing process for each of the emails they send. A/B testing is one of the most powerful tactics you can use for developing best-performing email campaigns. You can learn powerful insights about your audience and rely on hard data (instead of your gut) when crafting your next email campaign. However, the bigger your team is and the more tests you run, the easier it is to get lost in results if you don’t keep them organized. If you want to download a pre-made testing ledger template, there is a link at the end of this post. Finally, any email marketing manager should always keep a pulse on what other players are doing with email. Which means… they need to subscribe to dozens of newsletters and regularly check them. I can immediately see this becoming an inbox nightmare very quickly. Keeping email marketing organized pays off in many ways, the most important one of which is higher return on your investment. 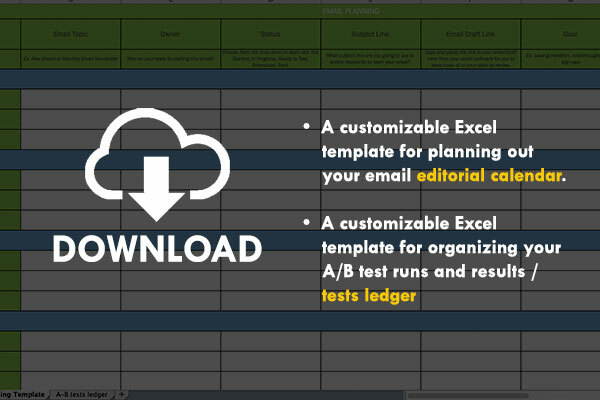 To help you organize your efforts well, I prepared an Excel template that you can use to plan your emails, build an effective email strategy and keep track of all experimentation you’re doing. It’s completely free, and you can download it right here. I’d love to hear how YOU are organizing your email marketing: the tools, the tricks, the smart hacks — please share them in the comments! Kasey Luck runs Bold & Zesty, a free newsletter about email marketing & productivity. Previously she did marketing at the most active venture fund in the world, 500 Startups, where she grew email list by 25,000 subscribers in 1 year. Connect with Kasey here.